And the detrimental effects of this practice, as stated by me in previous threads, is rather common knowledge among most airgun repair people that are up to date with current technology trends, but there were detractors here on the CAF that challenged the validity of the info that I presented, and demanded proof. Just an FYI, to help those contemplating having their airgun tuned, to make a more informed decision. Even before the bearing comes apart, the running surfaces inside become divotted by the pounding of the needles between the two running surfaces. The needle is harder, pockmarking the surface, and is one of the causes of its eventual breakup. I think one other person pointed out that if a needle thrust bearing is to be used, the surfaces must be precision fitted and fully suported so that the bearing is not under any undue stress. That work alone is worth far more than the average rifle it is being done to. Also, a thrust bearing is made to take a constant load, not one that is up and down like a toilet seat in a co-ed dorm. I read the thread that you posted the link to . Good information . The way I understood it was that it condemmed the use of real thrust bearings in spring guns . When I read about people putting washers in the piston , are they creating a " poor mans thrust bearing " out of Two steel plates (washers) with moly lubricant between ? I suppose they are trade secrets , but I wonder if anyone could post "successful" combinations of spacer (washer) thickness , weight , number and location of placement for some of the most common types of air rifles . By successful I mean setups that actually improve the shooting characteristics of the gun and last over thousands of shots . Not just increase the velocity . Velocity is useless if accuracy suffers to gain it . In my opinion anyway . I expect that each individual gun will be different , but I bet there will be some similarities within makes and models . "Assume you know didly and learn before you washer it up"
The use of thrust bearings, whether using needle rollers, or balls is not a good idea, nor is using hardened steel thrust washers with any type of lubricant between them - the end result will be similar - the hardened steel thrust washers will be pounded apart. The best washers, or spacers to use would be a tough grade of steel, or even a good grade of delrin or similar "plastic". Spacers added to the piston is generally done to a) add weight to the piston, and b) add some preload to a shorter than OEM replacement spring. Each gun is different, and each washer/spacer thickness is generally arrived at by experimentation with the gun model for which it is intended. James Maccari, for example, supplies all the necessary spacers, etc. with his kits - he has done all the testing, and optimization of the components. Sounds to me like you have a perfect understanding of what the ultimate goal of a tune should be. Thanks for the compliment . I'm always learning . I never bought in to the power craze . My favorite shooter right now is my home tuned CZ631 ,closely followed by my Diana 24 . I noticed that the 631 comes from the factory with a nylon (i think) spacer instaled in the piston ahead of the spring . I would have thought that CZ would have made the spring to egzactly the right length . The nylon spacer can't be contributing much weight . Unless of course it is part of the detuning process . Sure is a sweet shooter though . I never loose sight of the 1/4 inch target during the firing cycle . I wonder how that nylon spacer will stand up over time . Would it be safe to say though that it is still a good idea to polish the contact surfaces on either end of the spring ? Not to a mirror finish but maybe up to 1000 grit .? Then let the moly do its work . The nylon spacer is quite possibly part of the de-tuning - a shorter spring may have been used, and the spacer was used to make up the difference, and provide a bit of preload. Or, another possibility is that they use the same spring in more than one gun model, and simply adjust the spacer length to suit the application. The nylon should stand up quite well over time - it is a proven technique. You could try replacing the nylon spacer with one made of steel, then even try bronze, and see what the results are. Should make for an interesting experiment. Regards the spring ends - the most important part is deburring the sharp edges at the ends of the finished coils. A simple smoothing of the faces of the coil ends with 200 to 400 grit paper is quite adequate from the information that I have garnered. Regardless of wether they work or not, what are thrust bearings supposed to do in the first place? Len explained in an earlier post in this thread. Dated 27-Jul-07 - I can recall that a few years back, some tuners were experimenting with the use of thrust bearings on the spring guides in an attempt to eliminate mainspring twist. The basic idea is to allow the spring to rotate, as it is compressed and when it is released, without imparting any torque effect to the rifle. And about the thrust bearings thing, isn't it much simpler to just use some kind of teflon support disks on both ends instead? Like a spring guide except without the guide part. Some guns ,For instance the Quest series Are very rough inside the piston where the top hat sits . the flat surface in the bottom of the piston is a dificult place to get into to smooth out . But if you could (perhaps by spinning a tophat in place with some valve compound on it ; then make a new tophat and spring stop/guide out of bronze or nylon . Making parts that actually fit . You might just take some of the buzz out of these guns . Of course they could benefit from a heavier stock since the high powered ones jump around like a wild beast during the firing cycle . I'm thinking about experimenting with adding some weight to the Phantom stock . There are a lot of cavaties and areas where I could put the weight , The question is what to use and how to keep it balanced . Ideally I want something removable and of a uniform weight . Duct seal ? I know this may seem silly and defeats the purpose of the synthetic stock but it would be easier than experimenting with a wood stock . If the whole rifle weights just over 6 pounds I'm thinking of increasing the weight to 7 - 71/2 pounds and going up from there . Once I smooth out the firing cycle then I can go to work on the trigger . Lots of work there to do . Does anyone know which spring(s) JM sells for the Quest ? they aren't listed as such on his site . Lots of questions and slowly ,slowly I'm getting the answers . 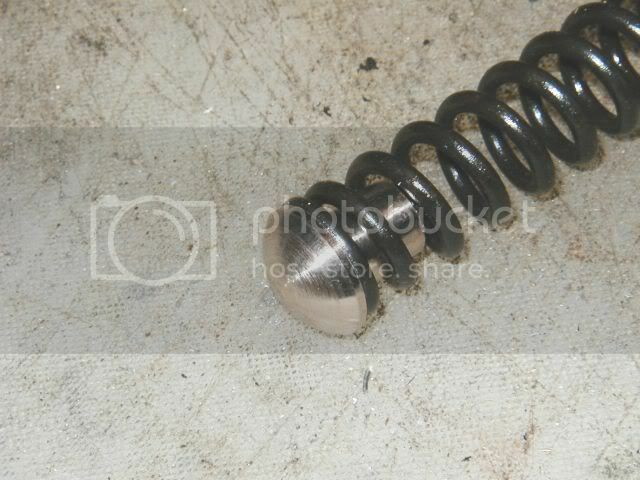 "The spring on a B-4 sits on a flat surface in the bottom of the piston. To allow the spring to freely twist or rotate during the cycle I made this round nose bearing from 660 bearing bronze." The gun had a bit of twang before the bearing was installed but that twang is gone now. I also replaced the plastic end cap with a metal one. Come and visit ..Doctor Frankenguns Airgun Forum..